Easter is probably one of the most celebrated holidays in the country of yogurt. It’s a favourite time for children and grown-ups alike. The tradition starts with the painting of boiled eggs on the Thursday, crawling under the shroud of Christ on Good Friday, followed by a candle-light procession on Saturday at midnight and ending up with a delicious lunch on Sunday of roast lamb and ‘kozunak’ for dessert. Undoubtedly, the most joyful part of this week of celebration is the painting of the eggs and the symbolic ‘battle of the eggs’. Tradition says that, on Holy Thursday, children and mothers gather to paint eggs for all family members and friends. 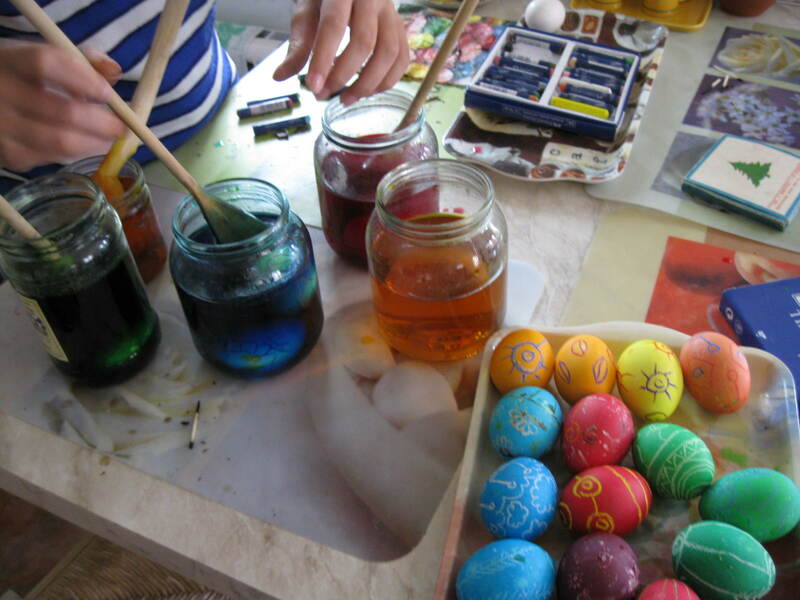 They use a mix of flowers, leaves, natural dye and paraffin to decorate the eggs. Thefirst crafty painted egg is always brightly red, symbol of the blood of Jesus and the wellbeing of the family. This red egg is used for making a symbolic cross on the front door of the house and on the foreheads of every member of the family. The next day, on Good Friday, we go to the church for a procession where we crawl under the shroud of Christ which is laid over the church’s altar table. 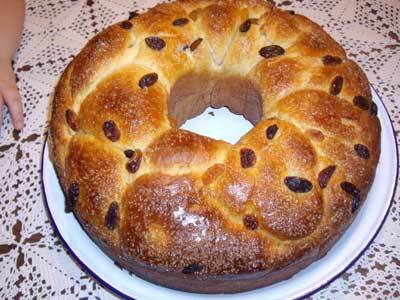 On Holy Saturday , we prepare Easter bread called Kozunak, a delicious sweet loaf of bread with sugar, raisins and almonds. Later that day we gather around the village church and start another procession: the midnight walk by candle light with the holy cross. We try to bring this sacred light straight back to the home fireplace, so that it gives warmth and energy to the whole family throughout the rest of year. We continue on Easter Sunday with ‘the Great Day’ rituals, when we gather in our grandparents’ house. On that day no-one ever says “Good morning” or “How are you”, because the traditional greeting is “Hristos Voskrese – Naistina Voskres”, which means “Christ is risen– Indeed he is risen”. All the children are excited because of the traditional egg-battle which takes place just before lunch. Each member of the family chooses their favorite egg, and then they crack their eggs against each other to see who will be the most successful, the healthiest and the happiest during the following year. The person who ends up with the last unbroken egg will, it is believed, have a year of good luck. We wish you all good luck and health throughout the rest of the year!